9th of August - happy birthday Singapore! In addition of National Day Parade and amazing fireworks, let’s celebrate National Day together with our Singapore flag products and decorations in red and white. Stand up for Singapore. Get everyone in a patriotic mood and ready to celebrate our country's birthday in style with great decorations. Set the scene with Singapore flag triangular or rectangular pennant banner hanging overhead and flying our national flag everywhere. Balloons always set the festive mood, so simply include the red and white latex balloons. For goodie bag items, go with Singapore hand flag, temporary tattoos, Singapore flag erasers, red whistles, hand clapper or balloon clappers in red and white. 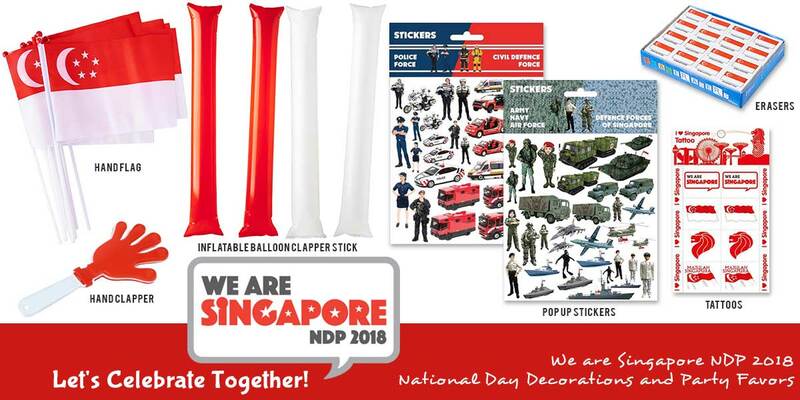 Our uniquely Old School Games are also the good choice items for NDP goodies. Red Metallic Tablecover 54"x 108"